Well, there's just enough snow and so I'm back from blogging vacation. I got out late Thursday afternoon and much of the morning today. We lucky locals can get a lot more skiing out of our all-too-short season. Here are some rules which have helped me. 1. Believe the reports Dottie puts on the website and in her emails. She has learned to be realistic even when delighted to have snow. And her between-the-lines meanings are always obvious. 2. Be strategic about when you go. If the prediction is for a cold night and a warm day, get there first thing. Skiing this morning was really quite fine until about 11:00, when it got soft and slow. If the prediction is for a warm night and a warm day but you know the snow is deep, bring nowax track skis and plan to cruise in a tee shirt. And don't keep waiting for those perfect weekends. If the skiing is great midweek, grab it for an hour in case it doesn't last. And if it's just adequate, grab it anyway, as it can always get worse. 3. Be thankful for the good grooming. John lives at camp, and can get onto the machine and trap snowflakes at any hour of the day or night. The camp even has a cab on the groomer. And with two setups, he, Tom, and their staff can touch up miles of trail quickly. 4. Be a good citizen when the cover is scant. Every twig and little rock hurts, and if we all pick them up it makes a great difference. Left on the trail, they attract solar energy and melt precious snow. And each one might make a beginner fall. 5. Don't expect to ski fast (or skate) when rocks and roots are exposed. It's almost impossible to miss them all. Learn to enjoy even this: meditate on the blue sky and open woods without forgetting the snow surface. Do a long and slow ski on the level upper trails. Be social with the people you meet and tell them how much better it gets. ...and don't ski again, Michael, without a camera. 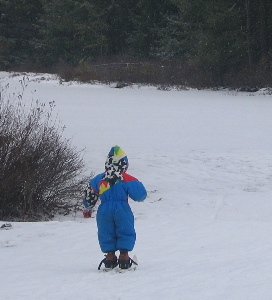 So here's grandson Levi's first ski, taken New Years Day. He's three and just became a big brother yesterday.